The French Women Don’t Get Fat Cookbook by Mireille Guiliano – Get Cooking! You are here: Home / Reviews / Cookbook Reviews / The French Women Don’t Get Fat Cookbook – Excellent! The French Women Don’t Get Fat Cookbook – Excellent! Fortunately, if someone is confident enough in their product to send it out for testing, they know they’re onto something special. Most people simply don’t want to pay shipping and handling charges to show off crap. I recently received an excellent cookbook, The French Women Don’t Get Fat Cookbook and I’m working my way merrily through the recipes. The author, Mireille Guiliano, has the type of writing style that makes you feel as though she’s a close friend dropping by for a visit. She has the culinary skills that make you want to cook for you while she’s there. I wanted to try at least 4 recipes before I wrote the post – so I could have quite a few of my favorites to tell you about – but, alas, I’m too excited with what I have tried to sit on the book any longer. First, a little about Mireille Guiliano: Mireille Guiliano is the bestselling author of French Women Don’t Get Fat, French Women For All Seasons, and Women, Work & the Art of Savoir Faire. Born and raised in France, she is married to an American and lives most of the year in New York and Paris. 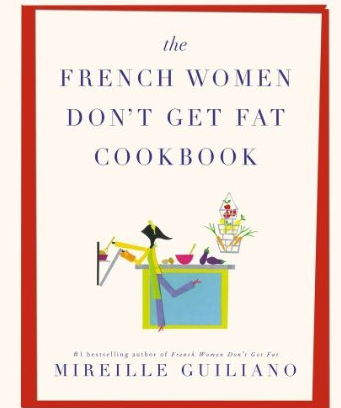 With The French Women Don’t Get Fat Cookbook, Mireille offers a long-awaited and much-anticipated collection of delicious, healthy recipes as well as advice on eating well without gaining weight. The recipes are so special, that it’s hard to believe that this is her first-ever cookbook. She shares with her readers the recipes that are the cornerstone of her philosophy—mouthwatering, simply prepared dishes that favor fresh, seasonal ingredients and yield high satisfaction. Filled with stories from Mireille’s childhood in France, her life in Paris, Provence, and New York, and her extensive travels and meals for business and enjoyment, The French Women Don’t Get Fat Cookbook is a beautiful, practical lifestyle guide to living well, eating wonderfully, and getting the most out of life with the least amount of stress. She is the former President and CEO of Clicquot, Inc. The first recipe I tried from the book was an apple oatmeal recipe called Grandma Louise’s Oatmeal with Grated Apples (you can actually find the recipe on French Women Don’t Get Fat’s website!). My husband’s feeling under the weather and I thought it would make him feel better. This oatmeal is utterly delicious. Eating healthy just makes you feel good all over – from your taste buds to your toes. I served the oatmeal with a little bit of cinnamon on top. You’d probably want to give your guests a few options to add to their oatmeal such as brown sugar, cinnamon, freshly ground nutmeg, and butter. However, please try it before adding anything else – you might find, as I did, that the wholesome goodness of the oats and the apples is outrageously wonderful as is. The second recipe I tried was Yogurt with Creme Chocolat because, irregardless of the language it’s speaking, chocolate is always speaking MY language. Oh my goodness, this was sensational. I’ve saved the sauce recipe and (please, please don’t rat me out to Mireille, but I plan on topping homemade ice cream with it this summer… shhhhh, good people, shhhhhh). These pancakes are stupid good. You’ll notice that I chose to use the picture provided by The French Women Don’t Get Fat. These are…. ahem… healthier looking than my pancakes sunning on their powdered sugar beach. Raspberries and other fresh fruit, sure that’d work. French women may not get fat, but we American women love our sweets. When we all meet somewhere in the middle, everyone’s licking their lips. Mix all the ingredients except the egg whites until just combined. Beat the egg whites to soft peaks and gently fold into the mixture. Heat a large nonstick skillet over medium heat. Spoon the batter by tablespoonfuls (I prefer mini sizes…it feels like more when it is less) into the hot skillet, and when holes appear in the pancakes, flip them and cook another minute or two, until they are golden. Repeat until all the batter batter is used. Serve immediately with a drizzle of maple syrup or honey. Add a few fresh berries if in season. All of the recipes I’ve tried have been STUPID GOOD. This cookbook is STUPID GOOD. Like I said, I wanted to try a few more before sharing this amazing book with you, but I simply couldn’t wait. I 100 percent recommend The French Women Don’t Get Fat Cookbook . In fact, I’ll be visiting Amazon soon to purchase Mireille’s other books. I’ll also be first in line for the next…. Okay, maybe behind her husband. Maybe.